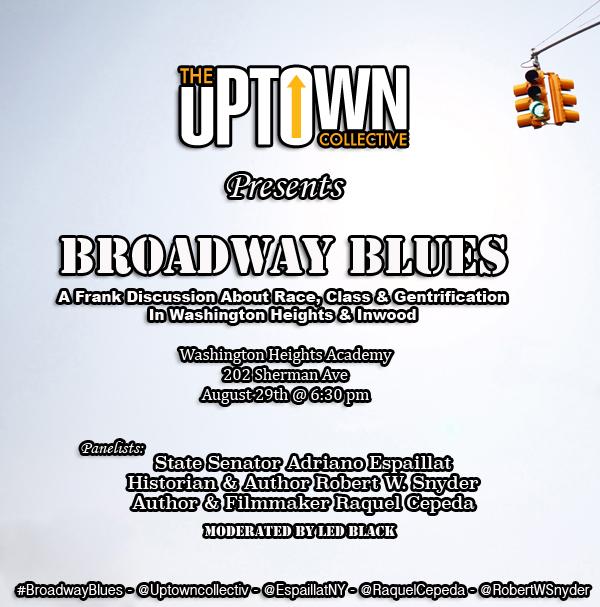 The “Broadway Blues” panel, which is taking place on Monday in the Washington Heights Academy at 202 Sherman Ave., will feature award-winning author, Raquel Cepeda, State Sen. Adriano Espaillat and director of American Studies at Rutgers-Newark University, Robert Snyder. “I think we have a crucial, small window of opportunity to maybe change the trajectory of what’s coming northward,” said Led Black, editor-in-chief of the Uptown Collective, who organized the panel, adding that because there’s a lot of “big money and play” happening uptown it’s up to those who live in the community to get involved. The meeting comes on the heels of a City Council committee’s unanimous vote against the Sherman Plaza rezoning bid — which followed vocal opposition to the project from the community. The project, which was the first private project to apply for affordable housing under the mayor’s Mandatory Inclusionary Housing (MIH) project, would have allowed developers to build an up to 17-story tall building in exchange for including additional affordable housing.